A solid strategy can make all the difference when it comes to stubborn bluegills. 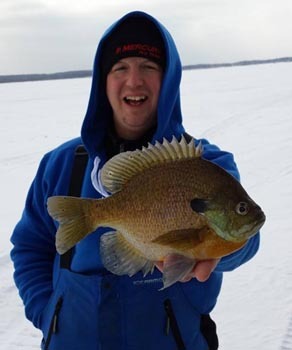 Once snow cover has taken hold and the early ice weed edge bite has come and gone things can become a little more challenging in the world of a bluegill angler. Fish may push out to deeper water, may cling to remaining green weeds or may choose to suspend over the basin in pursuit of plankton. Bites are often reluctant and can be hard to detect from even the largest bluegills in a particular system. Fish will often show up briefly on electronics and disappear at the first sight of a dropped jig. While many bull chasers take this period off and wait for late ice, panfish guides dont have a choice. We need to stay on bluegills all winter long and with a solid strategy you can too. Last winter was unique in many places throughout the ice belt. Lack of snow cover kept cabbage alive on most lakes in Minnesota. On many bodies of water bluegills held tight to the remaining green cabbage all the way through winter. I spent hours systematically checking holes with the Vexilar Fish Scout Camera looking for remaining green weeds. When we would find shallow isolated patches of healthy cabbage and coontail, we would find them loaded with fish. The challenging part of this can be finding the spot on the spot. Get too far inside the jungle and very few fish will see your jig between weed stalks. Get too far outside of the weeds and the fish will not investigate in fear of predators lurking in the open waiting for an easy meal. Find an open pocket inside the dense jungle and you could often continue to catch and work fish for an entire day from one vantage point. Once green healthy weeds are located dont stop at a few holes. Depending on the size and shape of a particular weed bed drill the area out in a grid pattern spacing holes no more than five feet apart. This kind of grid is going to allow you to find those sweet spots often leaving anglers only several feet away scratching their heads. When weeds die they actually begin to use more oxygen than they produce and fish are sometimes forced out of shallow weeds. It all has to do with snow cover as diminished light penetration is the leading factor in weeds dying off. My observation has been that the largest bluegills are often the first to evacuate the weeds and head to deeper water when the weeds begin to die but they dont usually go far. When scouting a new lake Ill often take a look at my lake map and find the fastest break lines into deep water and start there, drilling from the weeds straight out to the base of the slope. Once I hit the base I will drill perpendicular in each direction. The base of these steeply dropping slopes often contains the correct substrate for blood worms a main stay in the diet of bull gills. If this strategy doesnt uncover any bluegills I start to look for points and inside turns in a close proximity to the weeds that held fish at first ice. Some of my favorite mid-winter bluegill spots are located on inside turns close to healthy cabbage beds that are notoriously great first ice locations. My mind set is always to spend the bulk of my time searching close to where I previously located fish before striking off to different areas on the lake. Dont expect big migrations but expect them to stay close to the food shelf while maintaining close proximity to deep water where they can suspend to avoid predators. Rock piles are a favorite mid-summer bluegill location of mine and I usually return to them mid-winter. While the crown or very top of rock piles is often host to smallmouth and many other species, look for bluegills on the secondary drop off out to the base of the structure. This is where a good quality lake map can come in handy. One of the best bluegills spots I have is a rock pile with an adjacent island featuring a deep saddle in between. The key seems to be the access to deeper water. Natural funnel areas between basins can also be big gill producers. These areas naturally funnel food, typically always host green weeds, and usually have current and oxygen. Midwinter bluegills can be reluctant bitters often sampling a bait several times before timidly sucking it in. This is the time to break out the spring bobber rods. Many anglers mistakenly believe that they are marking fish on their Vexilar but simply cannot get them to bite. While this may be the case a little work with the underwater camera may uncover a different story, a story in which bites are just very subtle and hard to detect without a watchful eye and a light spring attached to the end of your line. A spring bobber rod like the St. Croix Legend can be adjusted to account for different weight jigs. You want something that will not load up under the weight of your jig. It then comes down to rhythm. You want to find a rhythm that the fish like and something consistent where you can recognize anything that breaks your rhythm. Any break in that rhythm indicates a fish, set the hook. Many anglers simply jig in an upward motion and let jigs fall on a semi slack line but this makes bite detection tough. My strategy is to break the wrist and jig with an up and down motion. When fish show a preference for a more aggressive jigging cadence, you can make bigger or faster up and down motions, and conversely when fish show a preference for a more subtle presentation you can swim your jig in a tighter up and down manner. Use your Vexilar to read the mood of each fish and adjust your jigging accordingly. While some gills like an aggressive pounding action it sometimes takes a subtle up and down swim to seal the deal. Like most anglers I often get antsy and want to drop a fast falling jig on top of any red lines that show up on my Vexilar but with stubborn bluegills a slow fall is sometimes the best option. If you are noticing that any bluegills you mark disappear when you deploy your jig, slow down. Fish are never dive bombed by natural food sources so once bluegills receive some pressure they can perceive these baits as a threat. Northland Fishing Tackle recently released the Helium Ice Fly line of jigs that are designed to have a slow decent rate to tempt even the most discerning pie plate sized gills. They are a hybrid fly, plastic combo and are specifically designed to have a tantalizing fall. 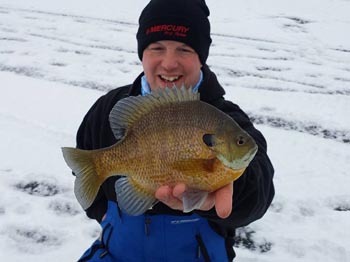 When the bite gets tough this winter go against the trend of bigger, faster, heavier and slow down to tempt stubborn bluegills. Garett Svir is the owner of Slab Seeker Guide Service http://www.slabseekerfishing.com http://www.facebook.com/SlabSeekerFishing and specializes in pursuing giant Central Minnesota bluegills.